David Brooks’ article, Lady Gaga and the life of passion, speaks of putting ourselves out there for something for which we are passionate. All that is needed for a person to conclude that Lady Gaga puts herself out there is to watch just one of her performances or appearances at awards shows. She wore a meat dress at the 2010 MTV Video Music Awards. Outsiders like ourselves look at such a display and might think unkind thoughts about a person who is extremely passionate about her craft. For most of us, putting ourselves out there means singing at the top of our lungs in the shower or car where no one can hear us. Or perhaps our definition of being out there means matching a floral print top with checked shorts when on vacation where no one knows us. I suppose that I didn’t know what I would become, but I always wanted to be extremely brave and I wanted to be a constant reminder to the universe of what passion looks like. What it sounds like. What it feels like. Given that description, us aforementioned outsiders might feel differently about how this extraordinarily talented singer/performer expresses herself. So what does it mean to live a life of passion? They construct themselves inwardly by expressing themselves outwardly. Members of the clergy sometimes say they convert themselves from the pulpit. By speaking out their faith, they make themselves faithful. People with passion do that. By teaching or singing or writing or nursing or parenting, they bring coherence to the scattered impulses we are all born with inside. By doing some outward activity they understand and define themselves. Mr. Brooks takes this thought even further by suggesting that another trait that marks the passionate among us is that “they have high levels of both vulnerability and courage…To be passionate is to put yourself in danger. Given that suggestion, it’s no wonder courage should be a part of the passionate person’s toolbox. Do you think the very first time Lady Gaga portrayed herself in the manner in which many of us have come to love, she did so without an ounce of concern or fear? A public person’s life is always under scrutiny. Lady Gaga is talented enough without having to resort to garish costumes and performances; she doesn’t need outward trappings to convince us of her talent and worthiness. But she chooses to put herself out there by girding her loins with the type of courage required of such a passionate and dedicated person. People with passion have the courage to be themselves with abandon. We all care what others think about us. People with passion are just less willing to be ruled by the tyranny of public opinion. As the saying goes, they somehow get on the other side of fear. A certain amount of fear is appropriate when embarking on a task that proves daunting, but if that fear paralyzes you, you’ve done yourself a grave disservice. When your passion about something is strong enough, you’ll have to draw on the courage necessary to stamp out the fear that would suffocate you. A little courage goes a long way, but passion will take you all the way. This entry was posted in 21st Century Living, Personal Struggles, Quality of Life, Recreational activities, Retirement and tagged David Brooks, Lady Gaga, NY Times. Excellent, Irene! We’ve got one life to live, don’t let fear hold you back. 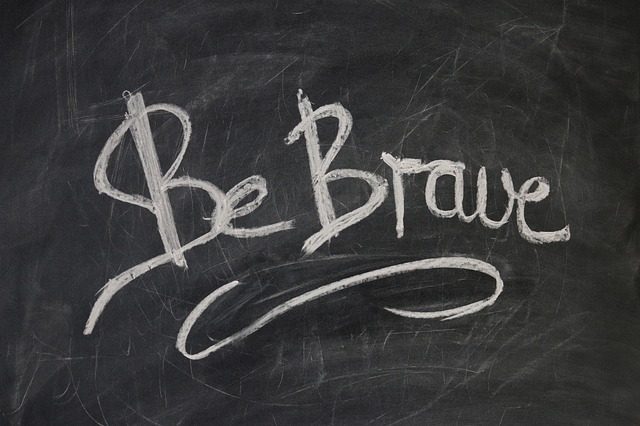 Do it afraid…the payoff will be better than a life of regret. I love that phrase: “Do it afraid.” Thanks for that, Jill. I can’t take the credit…I think I saw it on a bumper sticker year ago…but it stuck with me. Being stuck in traffic benefited the rest of us, allowing you to see that bumper sticker.